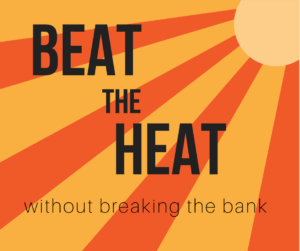 Looking for ways to reduce the impact summertime air conditioning has on your wallet and the environment? There’s no need to go expensive and high-tech; check out these tips for personal and household temperature control. You don’t need to cool your entire house to cool yourself. Here are a few tips for lowering your body temperature amidst hot weather. 1. Apply ice packs or a cool compress to your pulse points. The back of the knees, wrists, neck, and inner elbows are ideal locations. 2. Choose light, breathable clothing and bed sheets such as cotton or linen. 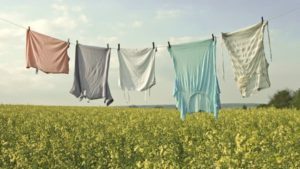 Take advantage of the outdoor heat and dry your laundry on a clothesline. 3. Take a cool shower or foot bath. Skip the socks afterward and stay barefoot. When you need to cool a home, consider cooling on a room by room basis. Here are some budget-friendly and low-energy tips for increasing your thermal comfort at home. 4. If you live in a place where it gets cool at night, you can cool your home overnight by opening the windows and letting the air in. Close them before the sun rises too high to retain the cool air and close curtains to block heat and direct sunlight. 5. 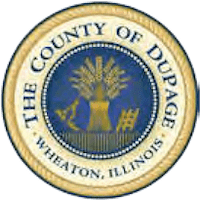 If your furnace fan is located in a basement, you can run the fan rather than an air conditioner to circulate naturally cool air to all parts of your home. 6. Unplug electronics when not in use. Many devices, especially laptops and desktop computers, emit a lot of heat when on. 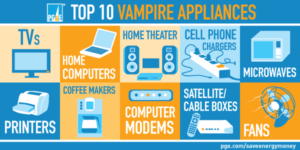 Each household has roughly 50 devices that draw power even when off or in standby mode. This equates to over $19 billion worth of unused energy each year. The solution is as simple as unplugging! 7. Hold off on that batch of chocolate chip cookies you want to make. Avoiding the oven and other heat-emitting appliances like the stove or dishwasher’s heated dry cycle will curb unnecessary heat sources. Try these no-bake cookie bites instead. 8. Make the switch to LED light bulbs. They are nearly heat-free and are cool to the touch as opposed to incandescent or fluorescent bulbs. In addition, LED bulbs use 75% less energy and can last up to 25 times longer than incandescent bulbs which lose about 90% of their energy as heat. 9. Have you ever experienced the temperature drop when entering a forested area? Adding houseplants to your home can help reduce heat. While it may not be too noticeable, they are also doing wonders for you indoor air quality. 10. If you already have ceiling fans, be sure you are using them correctly for the season. 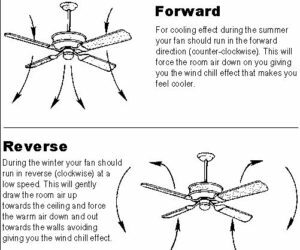 In the summer, switch the rotation to counterclockwise to pull up and recirculate cool air. In the winter, it should rotate clockwise distribute warm air. A ceiling fan costs roughly 1 cent for every three hours it is on and make you feel cooler by increasing the rate of perspiration evaporation. 11. Looking for long-term, eco-friendly, and/or energy efficient solutions to household cooling? Consider a vegetated roof or a white, reflective roof to reduce the heat island effect and absorption of heat into your home. 12. Use what nature already has to offer. 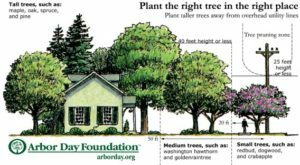 Cooling your home can be as easy as strategically planting trees that will grow to shade the roof and windows. A home shaded by trees can be 9 degrees cooler compared to those with sun exposure.